Coming soon, the the header of an article I will write. More than just showing me a quest in a far off land, a picture—especially one that another player took of something beautiful, interesting, or just funny—motivates me to actually visit that place. Seeing pictures of other people’s Kassandra or Alexios standing atop the mast of their ships made me want to get back on my boat. Seeing other people’s pictures of sweeping vistas or sunsets made me want to look for my own. I also stumbled on a picture from Kotaku video producer Paul Tamayo—his assassin was doing a leap of faith, the camera angled so that it looked like he was diving into a pool of stars. This feature turns the game into a travelogue. The game even has an Instagram-esque feature where players can “like” others’ pictures, and the total number of likes on that picture is displayed. I like the idea that someone, maybe far away from me, is getting a little token of appreciation for their photography skills. It makes me excited to post my own pictures and see which ones other players like best. 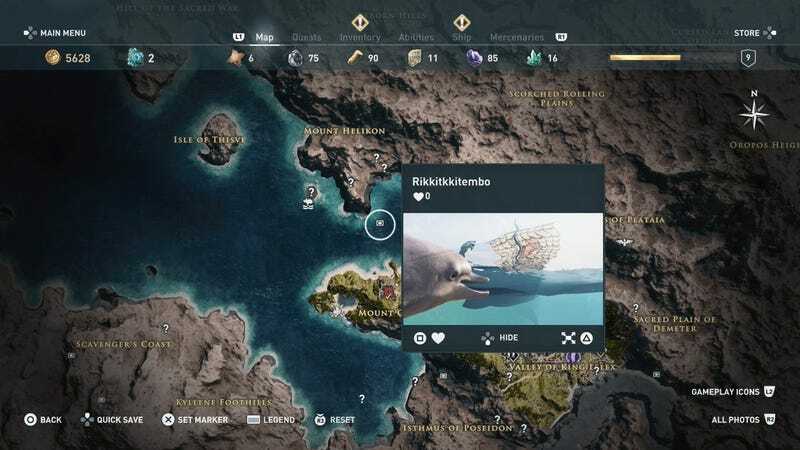 Assassin’s Creed Odyssey does a lot to make me feel as if I’m really uncovering a world bit by bit. Part of that is showing me what other players have discovered, tracking their progress through the game at the same time as I make my own way through it. Playing video games can be a lonely experience. And it’s nice to be able to know that there are hundreds of thousands of people out there playing this game at the same time. Even if we’ll never meet, we can share a tiny bit of this experience through our photos.